Time: 9:30 am. - 5:00 pm. To register you can contact the Customer Service Team by Phone: +66 2 513 1418 ext.110 Fax: +66 2 513 1419 or E-mail: thai@juz-talk.com. Once we have received your registration you will receive an email confirmation together with an official invoice within 48 hours. You can pay by bank transfer. What is included in the overall cost for the conference? Lunch and refreshments for each day of the conference. (Please note that travel, visa and hotel accommodation is not included in the registration fee). Should you be unable to attend, a substitute delegate is welcome at no extra charge. Cancellations must be received in writing at least 10 business days before the start of the event, to receive a refund less 10% processing fee per registration. The company regrets that no refund will be made available for cancellation notifications received less than 10 business days before the event. Some delegates may require a visa to travel to the host country for the event. It is advisable that you check visa requirements with your Embassy before travel and allow sufficient time for visa processing prior to travel. What happens when I get to the Conference? Please print out this confirmation within your identification card or business card to collect your Delegate badge from the registration counter located at the main entrance. Please note that Delegate badge will be issued only to those individuals whose names appear on valid credentials. Access to the conference centre and to the meeting rooms will be restricted to those people wearing conference Delegate badges. For security and identification purposes, all participants are requested to wear their badges at all times, whether attending meetings or social functions. Lunch and refreshments are served throughout each day of the conference. If you have not already informed us of any particular requirements necessary to fully participate in the event (for example concerning mobility, diet, food allergy or access) please contact us before the event. A Document Distribution Desk (hard copies) will be operating at registration counter from which participants may collect documents. A Downloading Documentation will be sent by conference secretariat to your email afterwards. Business attire is required throughout the conference. 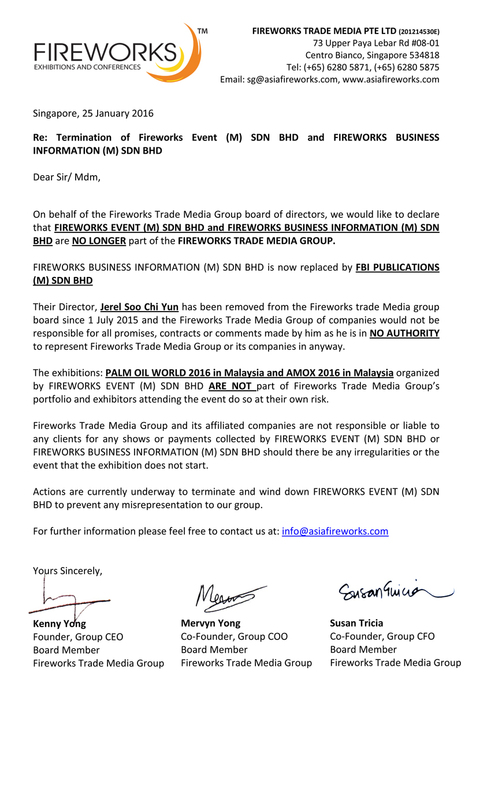 © Copyright 2015 - 2019 Fireworks Asia. All rights reserved.